These tasty wraps are a great way of feeding friends, just lay all the ingredients on a platter so everyone can assemble their own. Mix the mayonnaise and mustard, divide into 2 small bowls, then stir the onion into one bowl. 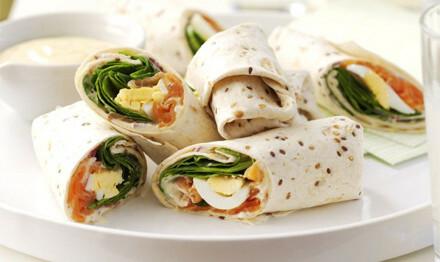 To assemble, spread a layer of the onion mayonnaise over each wrap and add 2 slices of smoked salmon, some sliced hard-boiled egg and a generous helping of spinach to each. Roll up tightly. The wraps can be made several hours ahead and kept covered in the fridge. To serve, cut each wrap on the diagonal into 2 pieces. Serve with the extra mustard mayo for drizzling. 01. Making it veggie : Swap the smoked salmon for strips of drained, roasted red peppers from a jar. 02. Make it easier : To make the wraps easier to roll up, give them a short blast in the microwave on a Medium setting.